Misfitz Black rubber zip T shirt. Misfitz Red rubber zip T shirt. Misfitz Black rubber zip long sleeve shirt. 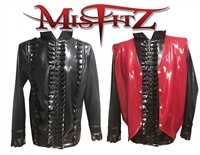 ORDER CODE MTZ447 PRICE �69.95 small - xxxl available) Misfitz red rubber latex long sleeve zip shirt. Rubber latex is the best quality 0.55mm, glued and stitched to the highest standard quality. Misfitz mens rubber latex long sleeve zip front shirt, With striking white rubber skull and crossbones motif. Made with the best quality rubber latex, stitched and glued to the highest standard. Misfitz black and blue rubber latex military shirt, with contrasting stars and stripes. Misfitz black rubber latex military shirt, with contrasting red stars, stripes and striking collar. Misfitz red and silver rubber latex military shirt, with contrasting stars and stripes. Misfitz rubber padlock strait jacket with four functional padlocks over a zip back. the arms. With padlock to collar front. Misfitz black rubber latex padlock strait jacket with buckle restraint strap to the front, double ended zip.